Written by Harry Hamm, Donny Weber and James Stanley Howen..... Jimmy Howen lead vocal, Nathan "Lee" Kadditz on flute and banjo, Geoff Landon on harmony, Don Weber on guitars, Russ Brunner on dobro, Tommy Greywolf on violin, Mike Spellman on bass guitar and Scott Mottet on drums. Produced by Don Weber. "A song of tragic love set in ancient American Indian lore for the telling around the campfire. This song was nominated on IAC Music for best country song of 2007." 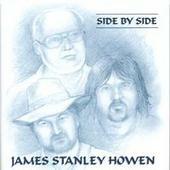 Listening to James Stanley Howen and the Mighty Rivers Band telling me this tragic love story set in ancient Indian lore reminds me of the beauty, peace and wonder of great storytelling and songwriting. Sitting here in front of a cozy fireplace on a cold winter night with my old Navajo blanket wrapped around my shoulders, I kept watching that big old moon as it drifted slowly through the night sky outside my window with the sound of that melancholy flute painting an enchanting picture and haunting vision of "Dances With Wolves" in my mind. Jimmy's warm and wonderfully peaceful voice, almost whispering at times like the restless spirits of the two legendary lovers held me spellbound and wanting to learn more about this warrior and his maiden. The lyrics are so wonderfully crafted and delivered so well that I could almost hear and taste the smell of logs crackling and burning in that campfire and the rippling waters spilling into each other right "Where The Mighty Rivers Meet". You are the consummate storyteller and troubadour Jimmy, and with that unmistakable golden voice of yours – ever so gentle and engagingly romantic here, combined with this beautiful music performed by gifted musicians giving the song authenticity to the ancient culture that it portrays, well, the effect and result on and for this old cowboy was entrancing and enchanting. Well-done Jimmy!! No wonder it hit #2 on the Country Chart here the first time you added it ... thanks for adding it back to your page again ... and Congratulations again! !